Probably you may have observed that the birds, those little creatures for which I feel a special preference, become quite frequently important characters in my books. Diario de un cazador is full of partridges, quails, ducks, turtledoves and doves. Viejas historias de Castilla la vieja, is full of great bustards, rooks and bee-eaters. The great duke is an essential piece in El Camino as the picaza is also essential in La hoja roja. The eagels, the kestrels and camachuelos are part of the environment of the little Nini in Las Ratas… Finally in my two latest novels, El disputado voto del señor Cayo and Los santos inocentes, take part three birds that play essential roles: the cuckoo and the rooks in the first one and the rooks and the cárabo in the second. Of those three birds I make my tool to compose the book that you now have in your hands, it is not a book of tales or invented stories, but a book of real stories, stories that I lived, stories in which those birds are the real protagonist. I hope that reading them doesn´t leave you indifferent but on the contrary they arise in you the love for nature. Miguel Delibes: “A mis lectores”, en Tres pájaros de cuenta. Valladolid, Miñón, 1982, pp. 4-5. Whether we like it or not, human beigns have their roots in nature and by uproting us with the lure of technology, we have deprived ourselves of our essence […] Fromm y Castilian retreit, or what is the same, my personal experience, these are the kind of issues that I tried to portrait in my books. We killed the fields and land culture but we haven´t substituted it with nothing, at least nothing worthy or honorable. And the destruction of Nature is not only physical, but also a destruction in its meaning for humankind, a truly amputation of the spirit of human beigns. Purity of air and water is stolen from human beigns but also it occurs an amputation of their language and the landscape that is full of referencing and characters and that conforms their comunity in which their life takes place, all this is transformed into a depersonalized and meaningless environment. In the first of these aspects, how many are words related to Nature and that right now they are already obsolete and that in a few years time they will not mean anything to anybody and they will become just a bunch of words buried in dictionaries and they will be unintelligible for Homo Tecnologicus? I´m afraid many of my own words, words that I use in my novels set in a rural environment, for instance, aricar, agostero, escardar, celemín, soldada, helada negra, alcor,( just to cite a few) they will soon need of translation footnotes as if they were written in an old fashioned language, when the truth is that thet only try to reflect life in Nature and the life of men and women that live in Nature and give name to the landsacape and animals and plants with their authentic terms. I think that the simple fact that our dictionary omits many names of birds and plants that are of common use in the rural life is a sufficient indicator of this aspect. Miguel Delibes: S.O.S. El sentido del progreso en mi obra. Barcelona, Destino, 1976, pp. 76-77. Peasants often use femenine, tender and softer and even more maternal terms and words than those used in dictionaries or by people from the cieties to name trees and birds. In cities or dictionaries the masculine term are prevalent .This understanding human beings-animals, human beigns-plants is plain to see in all my work that is full of partridges, hares, foxes, dogs, rats, goldfinches, roosters, doves, magpies, trouts..and also full of trees and bushes in such way that it is enough to open any of my books, even those of more urban topics to prove that those elements are constanct in me. 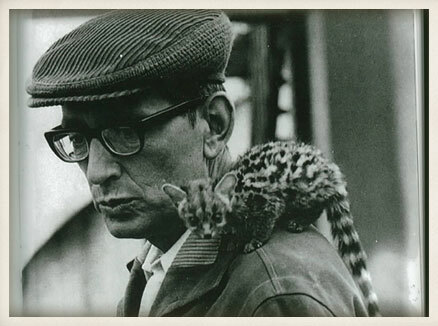 Miguel Delibes: “Humanización de los animales”, en Castilla, lo castellano y los castellanos. Madrid, Espasa Calpe, 1995, p. 108. Reading Delibes goes beyond literary referencing even if it is literature what he offers us. The fact here is that he is a novelist, as if we walked with him his hunting routes or around Sedano in Burgos, he invites us to stop in front of a scrub or at a small valley or hill, stop at a erode gorge or a flying partridge and a rabbit that starts to run away or an old man that has a little nap under a quince tree, perhaps without any memories and empty toughts. The landscape is alive and in it you can feel the beating of the surviving passion of the protection from the scorching hot winds or the northern cold that sometimes will leak through bringing cold winds that frequently mean bad omen. The land is full of life and it only needs of some eyes that reflect its beating heart and that is exactly what the books of Delibes offer. 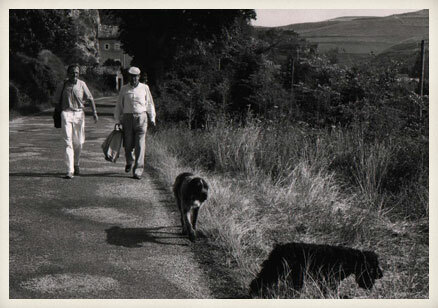 Miguel Delibes walking with his dogs, Grin and Cóquer. Sedano (Burgos). Emilio Salcedo: Miguel Delibes. Valladolid, Junta de Castilla y León, 1986, p. 60. After the spectacular cultural change in this quarter of the century, Delibes appears as a man advanced to his time. “In some way and without being conscious about it, I came to be a precursor that sensed the risk. When I wrote El Camino, in 1950, a critic observed that I was reactionary because the protagonist of the novel was a person who loved his village and refused to become part of the caos of the great city. Fourty years after, in a public event, the Minister of Culture, presented me as the first ecologist of Spain because of that book. What could have happened in the world only in four decades that two people could give such different judgemnts of the same writer? In Spain occurred the falling apart of the rural world and an exodus from the vilages to the great cities, and in the world a progressive damage and decline of the environment”. Miguel Delibes en César Alonso de los Ríos: Introducción a Conversaciones con Miguel Delibes. Barcelona, Destino, 1993, p. 16. When he had to decide the topic for his first dissertataion at the Academy that todas hosts him, Delibes has rather opted for what he has called the third tendency of his literary work, social preoccupation, anguish for the dangers that threaten Nature and the spontaneity of life in Nature. Delibes reflects about the fact that almost all his written works have focused on the idea of progress; he has been eager for it but also he ahs feared it; but above all he has not been totally convinced that the term “progress” was accurate for all that has been so called, or also the idea that progress does not necessarily mean destruction of many valuable things. These worries that come from his love to Nature and to the simpler forms of life, are to my eyes very noble worries and I totally share them. Miguel Delibes and the academic Julián Marías. Royal Spanish Academy, May 25, 1975. Julián Marías: “Contestación” al discurso de Miguel Delibes en el acto de su recepción en la Real Academia Española. 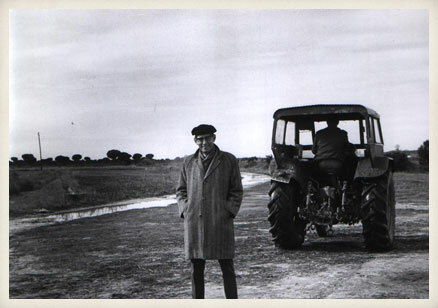 Valladolid, Miñón, 1975, pp. 75-76. It is not a strange thing that Miguel Delibes paid special attention to these matters that he treated with such simplcity and afection on the day that he became a member of the Real Academia de la Lengua (I was lucky to witness this day). He also didn´t hesitate to radically conclude with that theme of an old song: “If the world doen´t chage, If the world is not respected, let it stop so I can hop off from it”. This was a simple but very radical formula to say how much meant to him all along his life his live for Nature and how he values and respect it. The writer could have chosen othe topics, perhaps more specific for instance his own narrative, but he preferred paying more attention to environmental issues that back then were not so dangerous as they are today. With that message, Delibes´work was becoming universal because we all already knew that he was not referring anymore to the natural areas of his homeland but to the natural areas of the whole planet. In this way, we can say that the writer from Castilla was somehow advanced to his time in the vision of those issues that today- perhaps too late- all the political parties have in their electoral programmes. Antonio Colinas: “Los libros del corazón, los libros de la vida”, en Luces, trazos y palabras. Homenaje artístico-literario a Miguel Delibes. Universidad de Valladolid-Cátedra Miguel Delibes, 2007, p. 28. 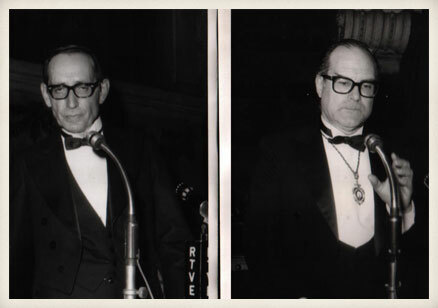 On the 25th of May 1975 Delibes gave his accpetance speech when he became part of the Real Academia de la Lengua Española. I was at that “high auditorium” (as Miguel Delibes called it once) and I still remember the amazement that invaded me when I heard his words. Those were, for sure, difficult times. The murder of Carrero Blanco had propelled the events and unchained the language or¡f terror in Spain where ETA and other terrorist groups attacks where inmmediately fought back by the extremist right wing and by the hardest of the police repression. I don´t really know what was I expecting when Delibes began his speech. I guess I though Delibes would evade all those matters talking about nature in his work awaiting better times. Soon I found out that his discourse was nothing but evasive, he would alert us about a more important kind of crisis than that that the Spanish people were inmerse in. The group of Spanish people that were in the Academy´s hall room at that very moment worried about Spain´s fate. But Delibes was talking about human kind´s fate as if our worries regarding our own country were unimportant compared to the upcoming catastrophe that was upon human kind. In his speech at the Real Academia, Delibes referred to the reports of the Club de Roma. They were reports made at the very first meetings of scientist from all over the world to face what today we called “climate change”. The chages that the environment is suffering due to the human action on the Earth´s biosphere. Delibes had an excellent councellor, his own son Miguel Delibes de Castro, a well known biologist who would become his professor in this phase that started with this speech and cocluded in the year 2007 with La tierra herida. Ramón Buckley: Miguel Delibes. Una conciencia para el nuevo siglo. Barcelona, Destino, 2012, pp. 205-206. Almost thirty years ago in my aceptance speech at the Real Academia de la Lengua, I took advantage of a very intelectual audience to express my anguish about the Earth´s future. That discourse ended up becoming a book called S.O.S as a first title and then Un mundo que agoniza. Even the time has gone by, my worries about the environment have not diminished, but just the opposite. Anybody who paid attention in the last ten years to my words and my public interventions, or read my fishing and hunting chronicles can prove it. The abuses of the people on Nature have not only become less but they have dramatically increased, resources used up and running out, pollution, shortage of fresh water, extinction of species…Some worrying issues that did not exist on the seventies have now appear new: the slimming of the ozone layer and climate change. Regarding Climate I should say that as a man of Catilla and a man of the countryside I have been always interested in that matter. I have pent great part of my life in the fresh air among farmers that surrender themselves to the weather will; men and women whose survival denpend more on the drought, hail or icing frost than on their own effort and work. What would it happen to us if the climate changed? And how would that change happen? I often vaguely read about the Earth´s global heating , but it was after the summer of 2003 ( a living hell that lasted five months), July of 2004 cought me in Sedano, a small villae in the North of Burgos, with temperatures of 2 and 3 Celsius on the plains and maximum temperatures of 25Celsius during the day. “This is not what we agreed” I said to myself. I had not forgotten the heat of the previous summer with almost 50 Celsius in the South of the country. At that moment I saw it clear that the climate change was not a mere theory but something real. It was not the time to come up with theories since the threat had become true. But the, what did that cold weather mean a year after? Maybe my fears where baseless? If the evidence that justified climate change did not adjust after twelve months, why was that rising and decrease happening in the temperatures? Under those circumstances I took advantage of one of the visits of my son Miguel, to consult him my questions and doubts. I asked him some questions linked to each other but in a relaxed way, nevertheless I guess faking didn´t worked so well and my questions revealed my deep preoccupation. His answers were so extense and detailed that in some more than twenty minutes we had engaged in an extremely passionate and revealing conversation about the future of the Earth. At the end of that morning I managed to convice Miguel to extend our conversation and even more to try to make it public and give some publicity to it since I considered essential that the inhabitants of the Planet got to know the opinion of the scientists about the situation that the Earth is going through. What can a scientist say to a person like me that I am somehow ignorant but worried? The reasoning of the experts are soothing or on the contrary enough to increase our preoccupation? And there was something else, if the problems were real, Why aren´t they getting propper solutions? Miguel Delibes: Prólogo a Miguel Delibes y Miguel Delibes de Castro, La tierra herida. Barcelona, Destino, 2005, pp. 7-9. Delibe´s preocupation about Nature cannot be separated from the his worries about the specific situation of the land where he was born and where he lives, in which landscape he sets the majority of his books and become a central topic of a couple of them; […] Viejas historias de Castilla la vieja[…] and Castilla habla, in both cases the main characters of a daily existence in Castilla talk about an unstoppable decline. Fiction or reality […] inventing or document, in all the books mentioned [ S.O.S., Vivir al día, Mi vida al aire libre, Pegar la hebra] and in some other that we could add we can witness the author´s enthusiasm for Nature, it is so intense that he proposes an intimate communion of the human kind with Nature to trnasfor it in their existing reason. That loving respect for Nature comes not only from his extensive narrative about it but even more from his direct contact with the land and his intense experience about the lands of Castilla, to sum up, all those aspects come from a keen attitude to live in the fresh air, the sport practice in “Un hombre sedentario” as Delibes called himself. His keen attitude to different sports, represented in Mi vida al aire libre, such as football, ciclying, swimming, marching…and among all of them to two sports in particular: hunting and fishing. Santos Sanz Villanueva: “Memorias de un cazador”, en El último Delibes y otras notas de lectura. Valladolid, Ámbito, 2001, pp. 62-63.